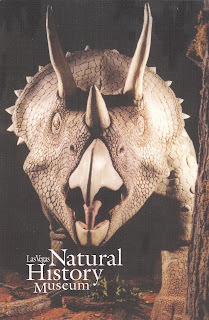 Postcard US-3916253 to Utah shows a Triceratops skeleton mounted at the Prehistoric Gallery in the Las Vegas Natural History Museum located in Downtown Las Vegas, Nevada. Triceratops, a term derived from the Greek with a meaning of "three-horned face", is a genus of herbivorous ceratopsid dinosaur that lived between 68 million years and 66 million years ago in what is now North America. 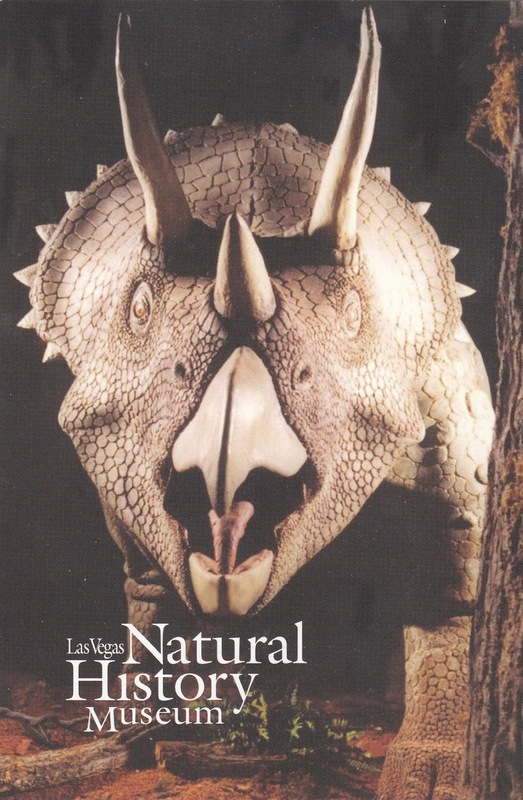 The private and non-profit museum, first opened on July 16, 1991, currently hosts Dinosaur Mummy CSI: Cretaceous Science Investigation, Engelstad Family Prehistoric Life Gallery, Treasures of Egypt, the International Wildlife Gallery, the Wild Nevada Gallery, the African Savanna Exhibit, and the Marine Life Gallery. It is currently participating in the Museums on US program, sponsored by Bank of America, which offers free admission to 150 museums in the US this weekend.